So to recap: before Emancipation in the US black people owned nothing, not even themselves. Then once they were free they owned themselves but very little else. They've been slowly dragging themselves up out of this ditch of absolute poverty, in spite of the many roadblocks put in their way by the white majority. The question isn't why are black people in the United States doing so poorly 150 years after slavery, the question is how have they come so far in spite of everything that's been thrown at them. 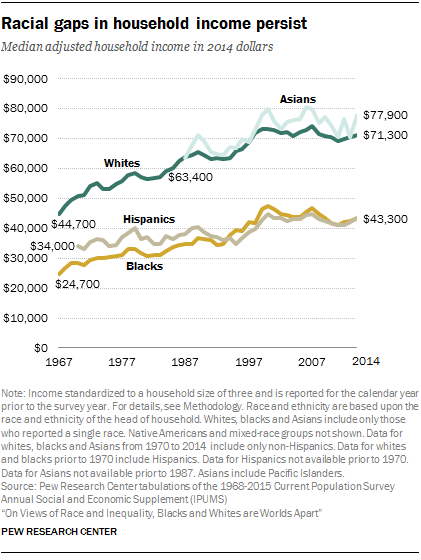 The Pew Research Center has some interesting charts comparing demographic trends for blacks, white, Asians and Hispanics. This chart shows how black students are catching up with white students for high school graduation rates. But their incomes have nevertheless stayed lower. A new study from the National Bureau of Economic Research (indicates)... the amount of money people make is strongly predicted by what their parents earn. Up until a parent-household-income threshold of roughly $150,000, adult children tend to earn another $0.33 for every dollar their parents earn. It is obvious that black earnings are lower because they started so much lower, and even increasing their "self-control" of finishing high school doesn't seem to help. Although it appears that the evo-psycho claims of black intellectual inferiority and criminality focus exclusively on North American subjects, at least one of the evo-psycho bros believes that failure is just a black trait. We'll look at that next.